VATICAN NEWS RELEASE: Pope Francis’s homily on Tuesday morning focused on the liturgical reading that narrates the stoning of St. Stephen, the Church’s first martyr. 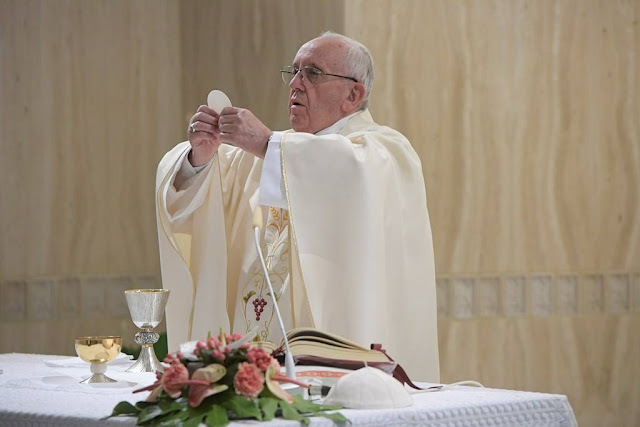 By Linda Bordoni Speaking during his homily at Mass in the Casa Santa Marta, Pope Francis said a true prophet is he who is capable of weeping for his people who do not heed him. He reflected on the liturgical reading of the day in which Stephen accused the people, the elders and the scribes of being stiff-necked people who always oppose the Holy Spirit, and just like their ancestors did, they persecute the prophets. Just like their ancestors persecuted the prophets – the Pope said – those elders and scribes who were so infuriated rushed upon Stephen, threw him out of the city and began to stone him. “When the prophet speaks the truth and touches the heart, or the heart opens or becomes stone, anger and persecutions are unleashed” he said “that’s how life ends for the prophet”. “Sometimes truth is not easy to listen to” Francis pointed out noting that “prophets have always had to deal with being persecuted for speaking the truth. A true prophet, he added, is he who not only speaks the truth, but is capable of weeping for his people who turn away from the truth. And he recalled Jesus who, on the one hand reprimanded his people severely calling them an “evil and adulterous generation” and on the other, weeping for Jerusalem. “A true prophet is he who is capable of weeping for his people but at the same time of saying strong things in a direct way” he said. And developing his theme further, Pope Francis described a true prophet as someone who is also capable of giving hope: “Opening the doors of hearts, healing roots, reinforcing the sense of belonging to the people of God in order to go forward. “A prophet knows when to scold but knows also how to throw open the doors to hope. A true prophet puts himself on the line” he said. Recalling Stephen who is put to death under Saul’s eyes in order to be coherent with the truth, the Pope quoted from one of the first Fathers of the Church saying: “the blood of martyrs is the seed of Christians”. “The Church needs prophets. What's more: it needs each of us to be prophets, not critics… this is something else” he said. He who just criticizes and is never happy with anything is not a prophet, Francis explained, a prophet is he who prays, looks to God, looks at his people and when the people err, he weeps. “May this service of prophecy never be lacking in the Church, Francis concluded, in order to be able to always go forward”.